We don’t believe that marketing for your business has to be costly. Sometimes we just don’t think of the most obvious things we can do to help our business gain more exposure, get more return business, and a healthier bottom line. As Food & Beverage professionals, we often have to wear many hats, and we can easily overlook certain items. We want to help you out a little by giving you some tips on growth hacking with one of the simplest tools you have on hand – the receipt ticket! Some of these items take a bit of discipline and planning. We guarantee you will have fun once you start making use of these! We understand that these may not apply to all and that’s a good thing! Whatever you can use from this will help your business get a firmer hold on its direction. With the limited space you have on your ticket, time for you to get creative and make a powerful impact! A clear and visible logo on your ticket is a must-have. It might not seem like much, but your guests need to be able to identify you at a glance. This is your identity and the most recognizable visual element. It needs to stand out from the others so you can set yourself apart. For a stronger brand identity, we recommend working with a professional designer. Having a printer that can print your logo with a reasonable resolution is essential to make this happen. What kind of visual impact will your guests not forget? This one might sound obvious to most of us. We’ll put it out there just in case because we have noticed a lot of people skipping this (one of the most basic) step. Choose the ones that are more appropriate to your establishment. If you want to encourage reservations and orders, then your phone number is the best. If you keep your Facebook feed fresh with cool new promotions, then send them there! What is exceptional about your brand? What is the one thing people should take away from it? Some restaurants don’t have a clear brand identity, some do. The logo is a good start; your outlet will also contribute. We believe that the receipt can help as well. For instance, if you are donating 10% of your profits to charity, then mention it on your receipt – no matter how cynical some guests can be, people are sensitive to contributing to a good cause. We said earlier that you want to be different. We have seen restaurants use their receipts to give people something a bit different to grab their attention. Some restaurants like to give out some poetry, rhymes, one-liners. Whatever your “thing” is, as long as you can get a smile on your client’s face, you’ve won that guest over and are increasing your chances of having him casually mention your outlet to his friends. We have seen even “serious” establishments take advantage of this with a touch of humor on their receipt. This is a risk worth taking. We encourage you to consider giving your clients an extra excuse to talk about you. Another way to get creative – give your clients a bite-sized piece of news. Up to you how you can best use that. Our suggestion, for instance, is: prior to wild mushroom, a special cheese, or truffle season starting, you want to get them excited so a quick one-liner to get them salivating and already thinking about their next visit is a great use of space that could have been stale. You can also communicate your upcoming events to get a buzz going. Used wisely, this can bring you a LOT of business – not only return business but also word-of-mouth. If you’ve got something special coming, this is another reason for your existing customers to get their friends excited about joining them next time around. That is tied into the previous point with a slight change in point-of-view. Here, you will want to think about ways you can lure your existing segments to change their habits and join you for other occasions. For instance, to get your lunchtime crowd to join for happy hour, or your weekday crowd to join during the weekend. Or maybe it is the evening crowd you want to target for your lunches or brunches. Do you get the message? Say you want to promote you lunch, you can grab your evening crowd’s attention towards your lunchtime promotions on the ticket. And vice-versa, you can guide your lunch crowd to your evening happy hour. Promoting items can help you guide your customer’s focus on certain items – maybe it’s your best-seller, or the item with the highest margin or simply your flagship dish. The point is that it is another way of increasing your chances of having your guests keep coming back for their next meals! That’s another brilliant way to use your receipt tickets – turn them into coupons. Not only are you raising the chance of your customers keeping your tickets, but you are also giving them a reward for coming back again. This is simplified Customer Relationship Management. A few weeks ago, I read something that is still on my mind – a marketing professional’s message was “people don’t buy brands, people buy people.” Reflecting on that one, I remembered all those commercials that went at length to tell you the story of the people working there rather than the actual brand itself. We think that introducing your staff breaks down barriers and will help your waiters more in the sales process. So who is new? Who did something that went beyond the call of duty? Who won a competition? Who just got a promotion? You want to build your mailing list so you can communicate via newsletters and special announcements? Ask your customers to send you their details to win a meal and collect their email address. What better way to communicate this to every single guest than with a quick message on the receipt? Those of you who follow us a bit know that we encourage a dynamic environment. In this case, we would encourage you to change your message… often! That might not be for everyone, but the bottom-line is the industry moves so fast that you want to keep your customers interested in what you have to offer. Also, it might take a bit of testing to see the messages that work at bringing you more business. This is perhaps one of the key points here. You’ve all noticed that today most of us like to either think of ourselves as critics or, in any case, look around for feedback and ratings before choosing a place to visit. You can get creative with this but most important is to guide them to your preferred sites: may it be your Facebook, TripAdvisor, Yelp, or other. This can make a huge difference between your restaurant dwelling at the bottom of ratings and making way to the top. Here you are; 12 ways you can hack growth through customer receipts. Not everything will apply to everyone, but at least this should get you thinking and excited about what you will do to stand out from the crowd and grow your business with this simple tool. 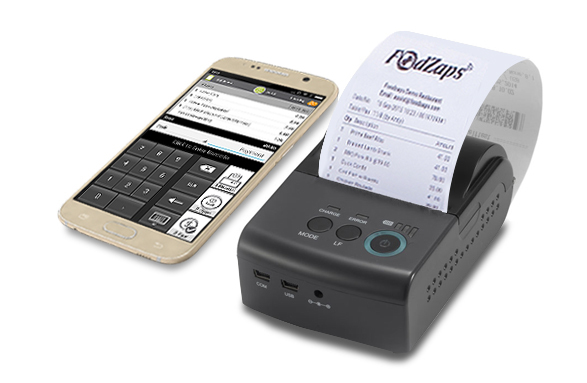 Having a system like FoodZaps that makes it super-easy and super-fast to modify your receipts at any time (even during service) is invaluable. You can test and adapt your message to best fit your crowd and guide your customers where you want them to go. We hope you found this blog helpful and useful and that you are now thinking of ways to improve your receipt’s message. Let us know how this is helping you! For a limited time only, we have a great promotion happening with the Bluetooth Printer pictured above. Get it sent anywhere around the World, buy it now for a 50% discount with the following code: “Zaps 50”.